The Fremont Rocket is another cool Fremont icon you should visit. 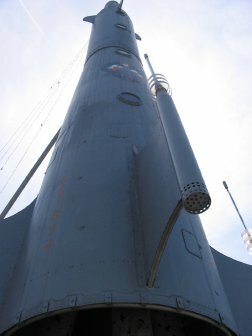 What is the Fremont rocket? I wasn't even aware of the Fremont rocket when I first visited the Fremont district because it's kind of hidden away off the main street. However, the rocket at the center of the universe (as Fremont claims itself to be) is a fun icon to check out that the kids love. The rocket itself is actually built from a 1950s-era Cold War rocket missile fuselage. After a failed attempt at getting the rocket up, it was finally attached to the side of the building in 1994. It even has Fremont's motto on the side of it, "De Libertas Quirkas". The translation is something to the effect of "The freedom to be peculiar". The rocket definitely fits into the Fremont atmosphere of quirkiness. 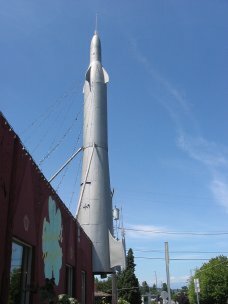 The rocket, located on the corner of Evanston and 36th even has steam that comes out of the rocket base when the missile is in launch mode. The statue is 53' high and is a pretty cool monument that you can check out with the kids. If you'd like some other neat places to see in Fremont, be sure to check out the Fremont bridge troll, the Fremont dinosaur exhibit, or the Fremont Lenin statue. Back from the Fremont rocket.